Baby / Toddler Cot Bed Fully Breathable Foam Mattress - Our Foam Mattress Is Designed To Give Your Little One A Great Night's Sleep Leaving Them Fresh And Rested For The Day. This fully breathable material is hypoallergenic. - Our Foam Mattress Is Made Up Of Fully Compliant 25hc Foam, Which Is The Legal Uk Requirement. Your Baby/Toddler Is Safe At Night. - Our Soft And Comfortable Supportive Foam Mattress Is Ideal For A Cot Or Cot Bed. Mattress features - The 'Open Cell' Foam Structure Allows Good Airflow And Helps Promote Heat Dissipation. - The Foam Is Free From Antimony, Phosphorus, And Arsenic Based Fire Retardant Treatments And Made With An 'Ozone' Friendly Formula. Mattress Care - Easily Cleaned (Sponge With Clean Damp Cloth And Allow To Dry Thoroughly Before Re-Use). - The Cover May Be Removed And Cleaned Separately Using The Zip At The Bottom Of The Mattress. - Use A Liquid Non-Biological Detergent And Machine Wash As Delicate (40 Degrees Max). - Rinse Thoroughly. Leave To Dry Naturally. Do Not Tumble Dry. Do not iron. 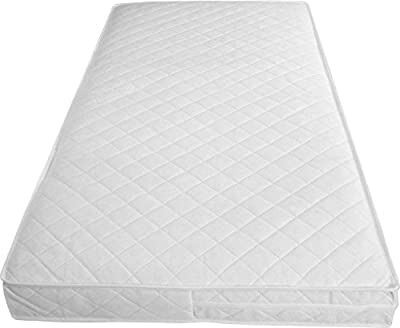 - Air Bedding And Turn Mattress As Frequently As Possible. 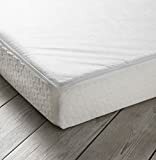 Mattress safety - COMPLIES WITH BS 1877: Part 10: 1977 - Complies With Bs 7177: 2008 The Flammability Performance Requirements (low hazard domestic use) - A Baby Who Is Being Sick Will Need Watching. This Mattress May Not Soak Up Vomit.